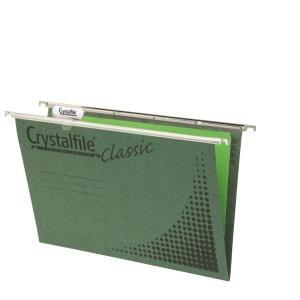 Use the Crystalfile® Classic Foolscap Suspension File to organise and store up to 150 sheets of paper. This complete suspension file storage box is available with push-down indicator tabs and inserts for convenience of filing. Featuring a labelling panel, this Crystalfile® suspension file can be easily identified for quick reference and retrieval. The pre-punched file is made of 100% recycled board, making it an environment-friendly product.